Last August the Beaver Creek fire ravaged S. Central Idaho, particularly the Sun Valley area, and the Smoky Mountains. The blaze was ignited by a lightning strike in early August, and continued it’s burn for several week, charring over 120,000 acres of prime wildlife habitat, and outdoor recreation terrain. Many popular trails in the Sun Valley and Wood River Valley area were scorched, and the Coyote Yurt that is operated by Sun Valley Trekking (SVT) in the Beaver Creek Drainage, was also lost to the blaze. 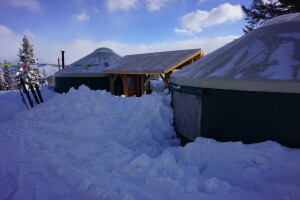 The Coyote yurt was popular not only for winter recreation, but also had gained traction as a prime destination for mountain bikers in the summer months, as some of the best single track anywhere rolled right out the front door making for myriad loop and one-way descent opportunities. Before the snows of the 2013-14 winter began to fall, the SVT crew pounced and built a beautiful new “twin yurt” shelter on the prominent outcrop were it sat before, and had it ready to go for the winter season to service some great backcountry skiing terrain. The new Coyote features one 20 foot yurt for cooking, eating, and a few bunks, while the connected twin is all bunk space. Roomy and comfortable, the location also has a new wood-fired sauna, and an outhouse where upon the throne you are rewarded with an endless view of the Boulder Mountains, and across to the Pioneer Range. 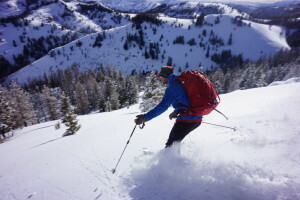 I met up with SVT guide Patrick Graham, who guided our team across the Monolith Traverse the previous winter in the Sawtooths to the north, for a few days of skiing at the new Coyote yurt, and a night at the nearby Tornak Hut also operated by SVT. The weather in the Bigwood River Valley was not looking promising, as the rain was falling steadily upon my arrival. The snow line was hovering near 7000 feet. We reconnoitered at the Baker Creek trailhead, after I dropped my vehicle at the Easley Hot Springs gate a mile or two down the road. SVT interns Trudy and Alisa made the shuttle pickup and the three of us met Patrick and intern Niels at the Baker Creek trailhead. It would be us five today and tonight as the interns were busy hauling supplies for the party that would be at Coyote the following night. With the use of a snowmobile, we made quick traverse of the flats across Baker Creek to the Left Fork Baker Creek trail, which gained a bit of elevation, and changed the rain to more of a skiing consistency. We then ditched the engine and began to zig up the slope, which was essentially a 30 foot wide slash between dense forests, it was cut as a firebreak for the Beaver Creek Blaze last fall. 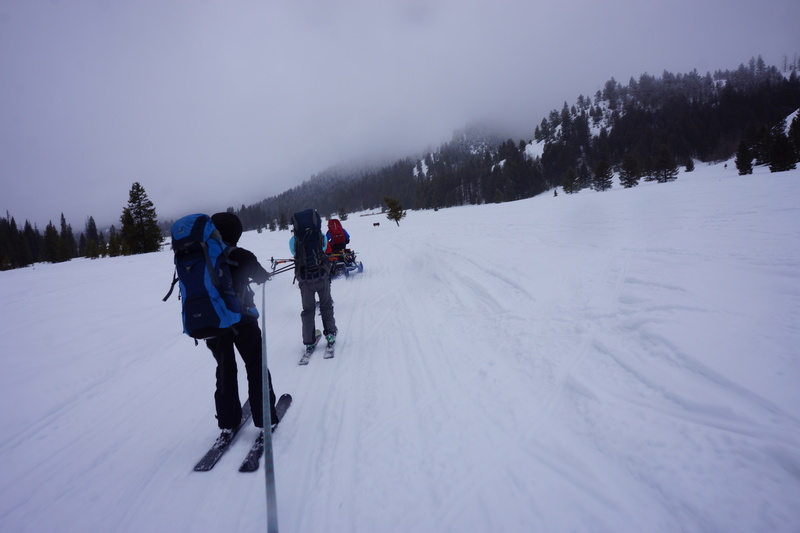 We made a cache at the top, and all enjoyed a fine run down a creamy slope to sample the snow which had now changed to a proper density. The lower we dropped, you could tell it wasn’t going to last as the weight and density of the snow increased with the higher water content. Back at the cache, it was a short stroll to the Coyote shelter, and our accommodations for the night. The storm was blowing out. 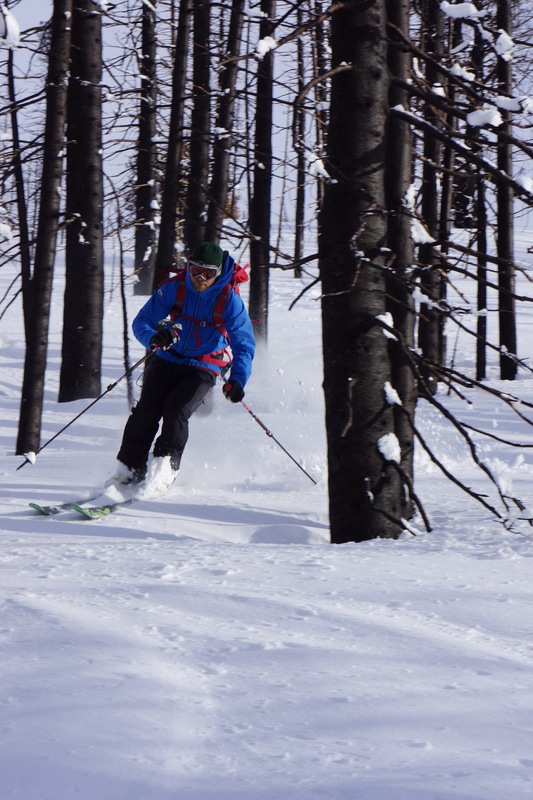 Patrick and I dropped loads, and headed out for a few late afternoon runs on the surrounding slopes where we found delightful conditions on a variety of aspects through the newly burned forest. A surreal scene for the senses of skiing on the white stuff through stands of blackened sentinels, the fierceness and ferocity of the blaze is evident in certain sections more than others, some untouched by the fire, while others completely seared. 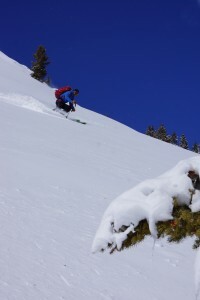 Patrick mentioned that these areas had perhaps never been skied before. The density of the forest would not allow for skiing, and the canopy would prevent any good snow from reaching the slope. We were essentially skiing slopes for the first time. A summit of nearby Fox Peak proved that the storm was blowing itself out was evident as the winds whipped over the high point, forcing us to get off the summit quick. We enjoyed untracked through another burn, and a short climb back to the yurt for the night. 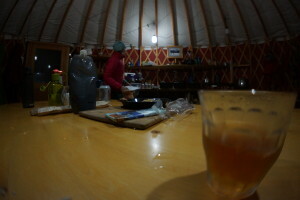 A flask of whiskey passed around the warm yurt, and a fine meal of curried chicken by Patrick, followed by a batch of Alisa’s cookies made for a fine evening. We enjoyed a leisurely start the next morning, said farewell to the interns, and headed out for our tour. A long descent through another burn yielded cold snow, and we made a move to the east sampling a variety of shots on a variety of aspects as they presented themselves. A lunch stop on top of Tornak Peak provided amazing views with mountains filling the sky in all directions. 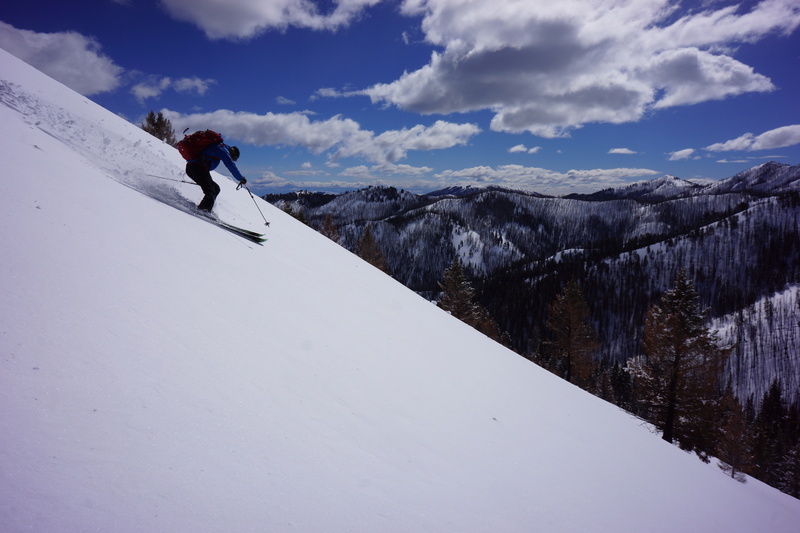 Patrick named off the summits and the choice lines as I made mental notes of the amazing quantity of lines that appeared skiable. Patrick confirmed the skiablity on all of them. Looking north, the upper Bigwood Valley, the Smokys on the left, Boulders on the right. We made our way south to the Fox Creek drainage, skiing soft,creamy snow on the souths, and colder powder on the norths. We reversed direction and headed north to gain the Tornak hut for the night, and our last descent down through a charred glade filled with soft snow had us talking of going up for one more run, but we decided that we had covered more than enough terrain for the day, and perhaps it would be wise to head for the shelter. Pato gets down to business. The Tornak hut is a great mountain shelter, long and spacious, with amazing views of the Boulder Mountains across the valley. We enjoyed a salmon pasta dinner, and called it a night early. We had a long walk for the day, and had gained a good bit of vertical, savoring every descent. The last day was bluebird, and warming up quick. A cold freeze the night before had put a hard crust on the previous days melt on the souths, but we still found soft snow in the sheltered slopes to start the day. A wide open slope facing south at the top of one descent had turned to that amazing metamorphosis of snow that happens in the spring- corn. 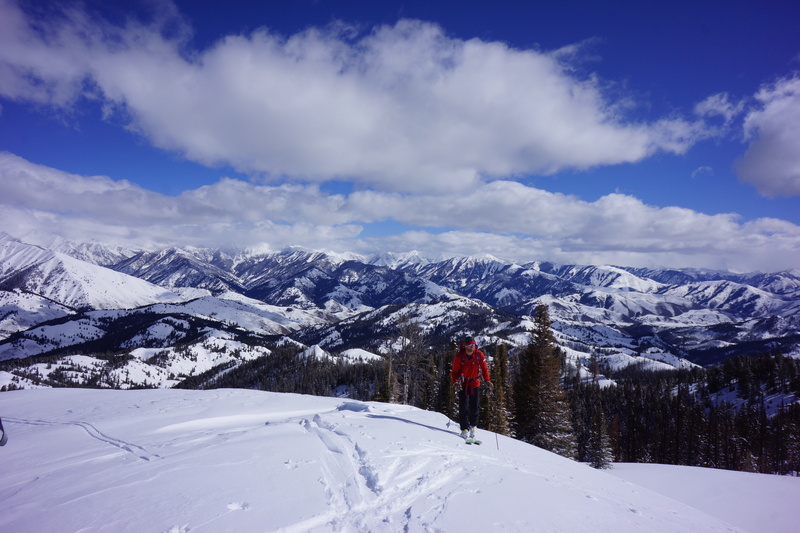 After a perfectly cooked descent, it was time to make a move for home, as I had to get back to Park City that night. We had one more creamy north run, and then had to take one more on the south facing, another great corn slope with views of the Smoky’s that won’t dissolve soon. It’s a big range, with lots of possibilities. The huts provide great access to wonderful terrain, with more remote options available for the adventurous. Summer will be here soon, and I’ll be heading back to the Coyote yurt to sample some of the Smoky Mountain single track that rivals anything- anywhere. The skiing does too.